Possibility to reach the car park P + R by bus lines D and 4 to Perly. We will walk on small roads and then take a path to reach the river Aïre that we will follow for a while. We will cross the new bridge and continue along country roads in France. We visit the villages of Thairy and Norcier (France) then we go back to Switzerland, going along a forest, then through the village of Sezenove. 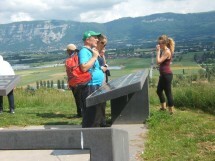 We will walk through the vineyards and will enjoy a beautiful view of the region from the Signal de Bernex. We will take a bus and a tram at the village of Bernex to return. Take your passport or identity card. Small picnic on the way. Take food and drink. Distance of about 10 km and almost flat. Shoe walking or running. Walk of about 2h30 to 3h. Expect to be back in town at 17:30. Little gradient. Two hike leaders, Pierre and Georges accompany you. 13:30 departure from the customs Collonges-sous-Salève. Return time 17:30. Participation of 5 euros for our association (with insurance). Une balade pour marcheurs "tout public". Le Signal de Bernex. Photos du 04/06/2016. Possibilité de rejoindre le parking P+R de Perly avec les bus genevois (lignes D et 4). Deux animateurs bénévoles : Pierre et Georges vous accompagneront. Départ 13h30 de la douane de Collonges-sous-Salève. Retour prévu à 18h00. Participation de 5 euros pour notre association (avec une assurance).